In Delta State and particularly among the Urhobo ethnic nationality, Chief (Barr) Jaro Movudu Egbo is a house hold name. 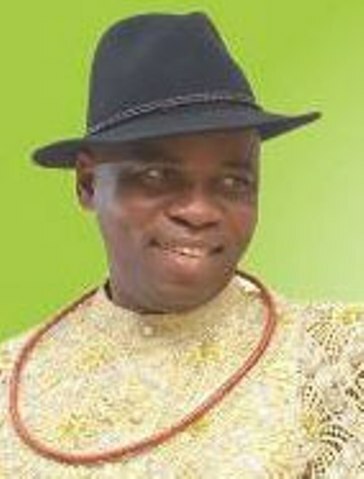 He is the President of Urhobo Ethnic Nationality Council, pioneer Secretary of Action Congress of Nigeria (ACN) Delta State and a Chieftain of Delta State All Progressive Congress (APC). The Urhobo Ethnic Nationality Council has been on news recently, what led to the reinvigoration of the group? Urhobo Ethnic Nationality Council is the coming together of all like minded Urhobos who are desirous of change given the fact that this is not the best time for Urhobos based on the spiral economic and political situation of Urhobos as a people. But there is one common thing among us which is change among our people. The way we do things is the major plank upon which Urhobo Ethnic Nationality evolves. We are a new group which believes in course of our agenda. Our modus operandi is to aggregate our interests. For every action we take, we want to look at it properly how it affects the Urhobo people and the common man on the street. It is not an elite group that is why we wrote Mr. President that our population which spread beyond Delta Central Senatorial District to part of Patani and Warri South and our contribution to the national economy we deserve full-fledge Minister. But the President in his wisdom has chosen Mr. Ibe Kachikwu to carry on what is doing in the oil industry. That is why we are also saying that we should be consider for other key positions since Mr. Ibe Kachikwu, Mr. Emefiele, Governor of Central Bank of Nigeria (CBN) and the Governor of Delta State from the Peoples Democratic Party (PDP) are from Delta North, we should be consider for Niger Delta Development Commission (NDDC), Nigeria Institute for Maritime Security and Safety Agency (NIMASA) where the life of the people can be affected positively. By next week we are putting another letter to Mr. President with a view of seeking audience with Mr. President and the Vice President as well. Is Urhobo Ethnic Nationality Council a political group? Well, we did not register with Independent National Electoral Commission (INEC), but we are a political pressure group with biased for Urhobos though we are not elites but we have lawyers, doctors, architects, accountants, people on the street as well because it is a grassroot movement. We are going to spread and lunch it at the local government, unit and ward levels before state and national. Does your group cut across political lines? Yes! Like I told you it is made up of like mind people who believe in change, even though change is All Progressive Congress (APC) mantra, we have people from Labour Party (LP) 10% and 15% from PDP. Our focus is to get more people so that we can move with one voice. What is the strength of APC in Delta State? APC is just two years old in Delta State. Unlike PDP which has been on for 16 years. It is only in Delta State you do not have the New PDP which did not fused into APC. There has been a lot of fighting on part of ACN and DPP that form the coalition. Some of us with PDP backgrounds believe there is no need for fighting so as not to profit the PDP but with the high level of our recruitment drive and because of the discontent, acrimony in PDP we can take up the state in 2019. Today APC is more vibrant unlike prior to Presidential Election. How is the state executives of APC will be able to harmonize? I am the pioneer State Secretary of Action Congress of Nigeria (ACN) that fused into APC. My Chairman then was Chief Adolor Okotie-Eboh. While I was on sabbatical in PDP there was misunderstanding as a result of the congress held and they went to court and the court held that the venue of the congress was not made public to the other group. They did not say anybody should take over, rather it ordered for conduct of another congress. The Chairman is Prophet Jones Erhue. You and I know that they went on Appeal and if a matter is in the Appeal Court the status quo remain. APC as a party also appealed the judgment. So we have one executive. I can tell you that my Chairman is the recognized person. He attended the National Executive Meetings and he was the one who took the other chairmen to see Mr. President. For you to see Mr. President you must be clear by Security. So the leadership and executive of the party is not in dispute of course you must understand that some people must make noise. Of course some people are not happy that we crossed into APC. They believed it should be port-folio party so that they can continue to collect subventions from the PDP but when they see the number of people they believe they have lost their dubious business because we are going to give them a tough challenge. Those are the people who are naturally against the growth of the party. They are agents of PDP because any genuine APC member is happy that the party is growing. We are happy to receive new members because no party grows without new members. APC growth today was because of the five Governors that left PDP. Kano State alone brought 2 million votes. There were also Kwara and Sokoto votes. If you remove these votes. PDP would have won anybody who is against new members of APC is an agent of PDP. We are still talking to them why taking patience from them when you can be the one to give them. Some have seen reasons, why some are still fighting. What is your take on the results of Delta Election Tribunal? The evidence was overwhelming. There was over voting and a lot of irregular votes, but if the tribunal can shut its eyes to it then it amount to robbing Deltans of who they elected. Since the evidences displayed would have been enough to order for a re-run. Is the judiciary part of the change the government is preaching or is there any attempt to sanitize the judiciary? I think change will not come easy. The judges are not people from another planet. Corruption is so endemic that some of them know that there is change and stand the risk of been sack or dismiss if it is discover that they compromise their position. I know what PDP can do. People lobby to serve as a judge in Delta State. INEC officials and even security agents make their way to Delta State because they believe we can bribe God. Chief P.D.O. Akpeki, Hon Misan Ukubenji and Ebifa defected from PDP to APC, what does it portray for Delta State APC? Five former Delta State House of Assembly members, former members of Federal House of Representatives, one former Senator and former many government officials have all defected to APC. We only asked them to wait after the ministerial issue. We are planning a very big rally where everybody will come on board. Outside that, the Governor is owing many people, so they are telling us to wait and let them get their money so we are very confidence that by January-February 2016, PDP is going to be a carcass. For the past 16 years after election those who contested elections are wooed by back to the PDP but I can tell you that since we came on board, nobody has left the APC. I can tell you that a former commissioner just called saying he needs party cards in a week, we register one to two thousand persons. The request for cards is very high. These are not just people, but leaders across the state we don’t want to speak now because we have an understanding very top government functionaries, commissioners, former commissioners, former secretaries to government, speaker, principal members of the House, former member of state Assembly, two former representatives, one former senator, many top government officials are coming on board including serving members of the House who are not happy with what is going on. For the first time we are seeing a party standing up to the government of the day in the state. People are tired. The government is making a lot of mistakes. They are awarding contracts left, right and centre to their cronies. The other day a National daily reported that a government that claimed it inherited N636 Billion debt had appointed over 1,500 aides. A Governor that appointed 1,500 aides in what way has he cut cost of governance? While the past Governor appointed 120 aides even the Federal Government did not appoint that much. We read in newspapers how Lagos State has been able to save N3 Billion based on how they have organized their state. Why has the Delta State Government not operated the Treasury Single Account (TSA) despite the entire stealing allegedly taking place in the office of the State Accountant General? So it is left for Deltans to ask a government that is going to give SMART and equity to all is doing all these. It will interest you to know and ask who was awarded the contract of Sapele-Ofagbe and Agbor Technical Schools? Who bided for the job? Another question is why did the Delta State Government carry its approval from N50 Million to N250 Million without recourse to due process? Is that the way to show you are in debt? And for the first time in 16 years our workers are not paid and you continue borrowing. That is why Deltans want change, because they are tired of this government of deceit. Given the kind of politics in Delta State and you being critic of the government of the day as a Chieftain of the APC, are you not afraid of your life? My security is in the hands of God. I believe if what I am doing is for the people, they will provide security for me. We have no guns, machetes but we have the people who believe it is time for change. Drive round the state, all our roads are bad, our street lights are not working and kidnapping has spiral. If government is doing well the opposition will have no choice than to praise it while people are improving their street lights to solar, our own are not working. Drive from Effurun to Warri it is not about me but about the people voted for government. Good talk @ Etebele. The first reality however is that the urohobo nation will get absolutely nowhere by being in the opposition party. In this our Nigeria, it is winner takes all. No urohobo person has been appointed minister or permanent secretary. There is no urohobo representation at National level in this govt. the best thing we can do for ourselves is to massively rally to APC if we are to be relevant in the scheme of things. If we continue with this madness of backing pdp, by next election 2019, we would be totally finished as a political force and what then will be the future of our children in this State? Fowl when de sleep for top of roof in lagos will equally sleep the same place when brought to asaba, all those defecting members of PDP to APC are all rotten eggs,dem de look for where to steal again,make una look dem well, 1999 till date robbers.